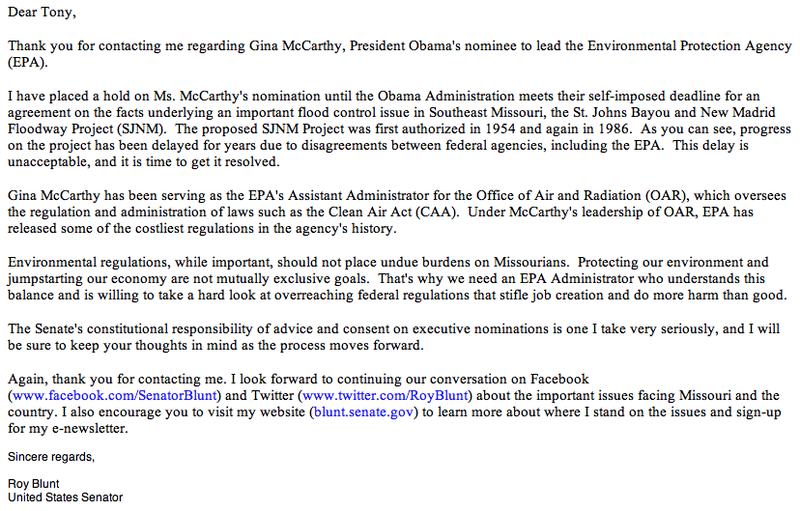 I signed a petition asking my Missouri Senators to approve President Obama’s nomination of Gina McCarthy as the next Administrator of the Environmental Protection Agency. But with so many things in our nation’s capital these days, decisions are left unmade and our lives hang in the balance. McCarthy was nominated on March 4, 2013. Her nomination was approved by the Senate Committee on Environment and public Works on May 16, 2013. Now we wait for the full Senate to approve the nomination. I wanted to share these two very different responses I received from my Senators – McCaskill and Blunt.